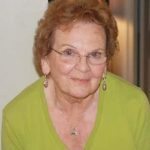 Yorktown, Va. – Mildred Bowler Ballew passed away peacefully on January 26th, 2019 in her home of 58 years in Yorktown, VA. She was 88 years young. Born to Clyde and Ethell Bowler on August 23rd, 1930, in Johnson County, NC, Mildred was one of 7 children. In 1944, the Bowler family moved to Hampton, VA where the stars aligned and the most beautiful love story began when Mildred found the love of her life in the boy-next-door on Pine Chapel Rd. She had found her “Buddy” and their adventure had begun. Mildred married Arthur “Buddy” Ballew on October 9th, 1948, and together they had 4 children, Timothy Ballew and his wife, Joyce of Gloucester, Keith Ballew and his wife, Jarlyn of Seaford, Melinda Pollard and her husband, Wayne of Yorktown, and Donna Combs and her husband, Malcom of Gloucester, and were blessed with a host of grandchildren and numerous great-grandchildren. In 1977, Mildred co-founded Yorktown Flower Shoppe where she worked until her retirement in 1996. Mildred and Buddy lived life to the fullest; traveling with their friends, attending church, watching “The Wheel”, sitting on the back porch, and falling more in love with each other every day that led to a happy 60 years of marriage together. After Buddy’s passing in 2008, Mildred kept busy by gardening, rocking great grand-babies, reading, thrifting at the Bargain Box, enjoying time with her best friend, Maree Stroud, and writing to Buddy every night in her journal. She never missed a beat; staying active and social until her very last days. She is survived by her large loving family who she taught everything they would ever need to know except one thing…how to live without her. Services will be Saturday, February 2nd at 12:00 PM at Orcutt Baptist Church in Newport News, VA. Visitation will follow the service. Burial will be private. Arrangements by Amory Funeral Home, Grafton, Va.